A play about Darwin was on stage in New York last month. Now, there is a new play about the excommunication of the 17th century Jewish philosopher, Spinoza. The play is titled, New Jerusalem: The Interrogation of Baruch de Spinoza at Talmud Torah Congregation: Amsterdam, July 27, 1656 - (great - now you know the full story just from the sub-title). As that daunting subtitle suggests and students of philosophy will know, the play is based on actual events. 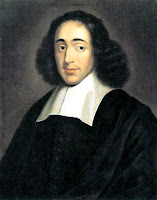 Spinoza, a Portuguese Jew living in Amsterdam, was a brilliant scholar whose inquiries led him into territory that made trouble for his fellow Jews, who were graciously tolerated if not wholly welcomed into Dutch society. Mr. Ives lays out the mechanics and the consequences of Spinoza’s interrogation in a debate among van Valkenburgh; the city’s chief rabbi, Saul Levi Mortera (Richard Easton), Spinoza’s teacher and mentor; and Gaspar Rodrigues Ben Israel (Fyvush Finkel), a “parnas” of the temple congregation, or member of the committee that will pass judgment on the case. At stake is possible excommunication from the religious fold, and indeed all social contact with the city’s Jewish establishment. What exactly is Spinoza accused of? Oh, just general atheism and heretical questioning of key tenets of Judaism and Christianity. But before presenting the interrogations as a battle of ideas between Spinoza and his accusers, Mr. Ives gives us a snapshot portrait of the philosopher as a young man. 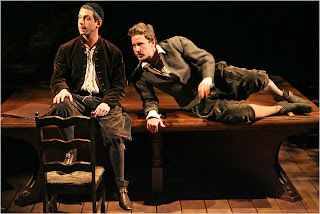 Idling at a tavern with a friend, Simon de Vries (Michael Izquierdo), the young Spinoza, who is played as a gentle-hearted genius by the engaging Jeremy Strong, speaks of his interest in things eternal and things mathematical, and the connections between the two. Later, exchanging confidences with a music teacher, Clara Van den Enden (Natalia Payne), to whom he is romantically devoted, he dismisses as “entertaining stories” many of the biblical tales she holds dear. “Nature, which is to say God, cannot depart from its own laws,” he explains in a friendly tone, as if speaking of simple sums. Check out the full review here, and here is more information about the play. Vatican astronomers being upgraded or downgraded?